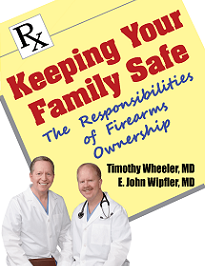 Doctors for Responsible Gun Ownership (DRGO, A Project of the Second Amendment Foundation) relies on member funding for its operations. 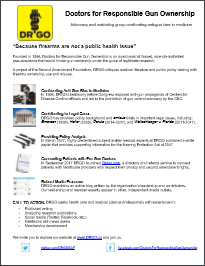 DRGO’s activities are particularly important now as false ‘Public Health’ arguments and spurious research intended to support those arguments are the new line of attack on our Second Amendment rights. 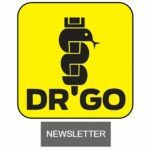 Do you have skills such as writing or social media management that you can contribute to DRGO? We welcome qualified contributors in these fields. See the form, below, for a list. 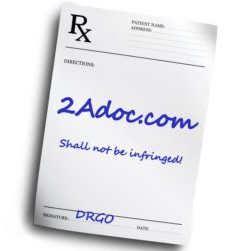 DRGO launched 2Adoc.com to connect patients with healthcare providers who respect their second amendment rights. If you are a healthcare provider and would to increase your patient size, consider registering with 2Adoc.com. A patient request form will be available soon. The service is free and participant information will not be shared publicly. DRGO has partnered with the United States Concealed Carry Association to offer a 15% discount on any USCCA Membership. This includes up to $2,250,000 in up-front Self-Defense SHIELD protection, 24/7/365 Critical Response Team access, Training & Education and much more. Details on this USCCA promotion will be sent to you in your welcome email.